Most gardeners seek to deter deer from their garden, but you can support the deer population in your area by planting a few deer-friendly crops. Chances are, you'll attract other wildlife to your yard, as well. 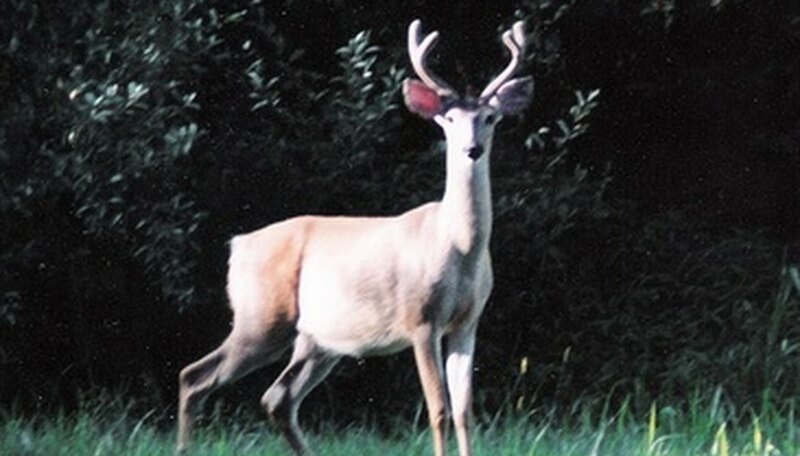 Deer have varying nutritional needs depending on the time of year and the age of the deer. Deer actively forage for food in the spring, when their reserves are depleted, during pregnancy and in the fall, as they store fat for the winter. Deer actively seek food in the spring after surviving a long winter. Grasses are among the first vegetation to appear. Deer munch on early grasses, such as June grass, blue grass and timothy in early spring. Like cattle, deer are capable of digesting a variety of plants, including woody plants, grasses, berries and grains. Green feed crops, such as clover, vetch and alfalfa are fast-growing ground covers that are also high in nutrition. Deer feed on many wild plants, including ragweed, lamb's quarter and jewelweed. Before you pull these common weeds, consider leaving them for the deer. They provide a nutritious, tasty meal for deer, with no cost or effort from you. Leave some stubble in your garden or fields after harvesting hay, winter wheat, corn or soybeans. These crops provide valuable nutrition for deer during long, harsh winters. Winter mortality for deer populations may be as great as 50 percent, according to the Michigan Department of Natural Resources, depending on the quality and quantity of available food and cover. Deer consume a lot of water in the spring, resulting in electrolyte imbalances. Plants don't provide deer with the sodium they need, so providing a mineral block is a good idea. Always check with local authorities, though, if you plan to hunt in the area. Mineral blocks are considered "bait" if you use the area for hunting and may be illegal.